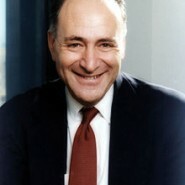 Senator Charles Schumer of New York likes to encourage his staffers to get married—to one another. So far, there have been 10 weddings among his staff members, and two more weddings are scheduled for this coming fall. The senator takes pride in the fact that he has made a “Schumer Marriage” for every year he has spent in the Senate. “Our staff is a family,” Senator Schumer explains in a fatherly tone. One couple, Josh Isay and Cathie Levine, who worked on Senator Schumer’s staff in 1997, thanked their matchmaker by asking him to sign their ketubah. Amichai Speaks with Shira for 1st Time: "You are a Powerful Woman!" wonder how many kids he has.